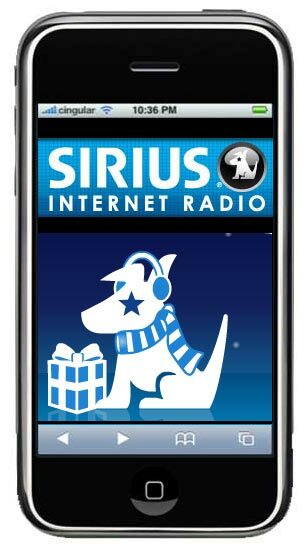 My wishes have finally come true: Sirius is now accessible on the iPhone, thanks to Jason Millard’s brilliantly designed software uSirius for the iPhone. Of course, you need an internet streaming subscription to Sirius in order for the player to work. I’ve had Sirius since its early days and gave my system to my sister when I moved overseas. I thought about buying another one, but decided to add on internet streaming to the account for $2.99 and stream to my Mac using StarPlayr2. I knew eventually someone would develop an app for the iPhone and couldn’t be happier. uSirius is in beta and buggy, but with its most recent update yesterday I can’t complainâ€”it works greatâ€”even over the Edge network. Don’t bother with anything older than v.62â€”many of the channels don’t work correctly and end up playing Howard Stern instead. I used it in the car today and was amazed at how well it worked. One quick tip: if you’re driving, make sure you turn off your WiFi connection. Otherwise, uSirius will disconnect and stop playing every time you drive by an available wireless signal. With that in mind, it takes about 30 seconds to buffer using Edge, but it sounds as good as my old Sirius car system did. I can’t help myself. I’m a tech junky who loves his music too.